In recent decades there has been a decline in the quality and availability of psychotherapy in America that has gone largely unnoticed—even though rates of anxiety, depression, and suicide are on the rise. In Saving Talk Therapy, master therapist Dr. Enrico Gnaulati presents powerful case studies from his practice to remind patients and therapists alike how and why traditional talk therapy works and, using cutting-edge research findings, unpacks the problematic incentives in our health-care system and in academic psychology that explain its decline. Beginning with a discussion of the historical development of talk therapy, Dr. Gnaulati goes on to dissect the factors that have undermined it. Psychotropic drugs, if no longer thought of as a magical cure, are still over-prescribed and shunt health-care dollars to drug corporations. Managed-care companies and mental health “carve outs” send health-care dollars to administrators, drive many practitioners away, and over-burden those who remain. And drawing back the curtains on CBT (cognitive behavior therapy), Dr. Gnaulati shows that while it might be effective in the research lab, its findings are of limited use for the people’s complex, real-world emotional problems. 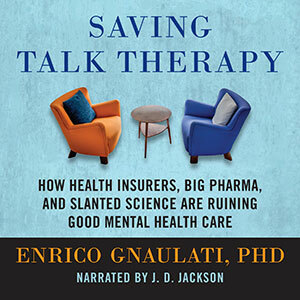 Saving Talk Therapy is a passionate and deeply researched case for in-depth, personally transformative psychotherapy that incorporates the benefits of an evidence-based approach and psychotropic drugs without over-relying on them.